No region of Italy avoids a period of cold weather during the winter, so if you’re buying an Italian home you should consider not only how to stay cool in summer, but also how to keep warm on a winter’s night. There are air-con units that heat as well as cool, but electricity is your most expensive heating option, and you can’t exactly cosy up under an aircon unit. Our living room didn’t have a fireplace, so my husband built one himself using the local Puglian sandstone. He carved the soft stone himself, to match the original star vaulted ceiling built in the 1600s. 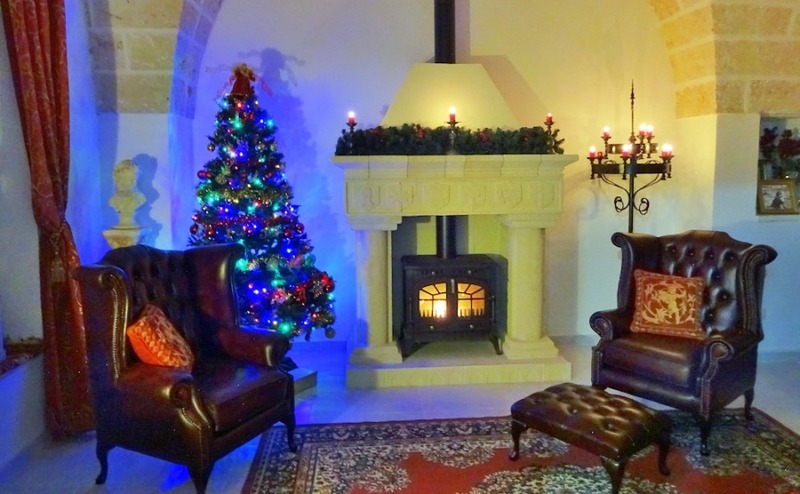 A fireplace can be an attractive focal point that gives a warm homely feel to your Italian property. During the winter season they look particularly festive all dressed in foliage. We decorate ours at the start of each new season of the year, reflecting the colour scheme, flowers and produce at the time. Many Italian properties have fireplaces, including townhouses and homes in the warmer southern regions. There are even new villas being built with chimneys and modern looking fires or wood burning stoves. Our fireplace and stove that my husband put in. If you’re moving into your Italian home during the winter, before the central heating has been installed, the large portable heaters that hold a gas bottle (bombole) can provide adequate temporary heating in living rooms. They are also a good backup during a power cut. Portable gas heaters supply a good amount of heat and you can often buy replacement bottles easily at your local hardware store for around €21. But, in our experience, they can also cause condensation that results in mould. Plug-in electric heaters, although more expensive to run, are good for taking off the chill in the bedrooms. 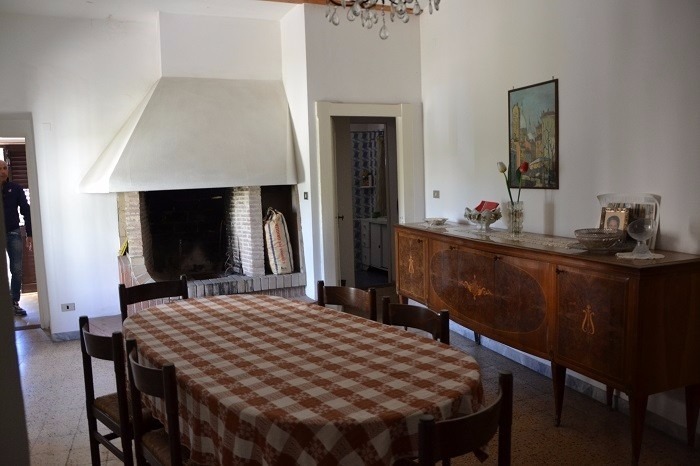 If you are lucky, your house will already have a fireplace, like this town house for sale in Abruzzo for just €110,000. Click on the image to view more details about this property. Should you get a woodburning stove? Many people very quickly buy a small woodburning stove for their main living area, as they throw out a lot of heat and are cleaner than an open fire. It’s worth spending a little more and getting a decent sized one. Otherwise, you’ll be continuously having to feed it tiny bits of wood. Burning wood is the cheapest heating option in Italy and it can work out very economical to heat living areas with a fire. That way, you only use the central heating to warm other rooms at bedtime. This is particularly true if, like us, you own land with plenty of trees. Wondering how to access medical care abroad? Download our Healthcare Guide to find out how. We have over four hundred trees, mostly olive, but also some almond and pine. We find that, just from windfall and pruning, we get plenty of wood for all our heating needs. Even people who live in town often have a plot of land with trees in the countryside. In the autumn, you see them bringing the wood into town and stacking it in their garages. If you do decide to chop your own wood, you will need to plan a year ahead, so that it has plenty of time to dry out before use. We are currently using wood chopped two years ago, which gives off very little smoke. We decided to install a very large woodburning stove into our existing kitchen fireplace. Due to its size and weight, this was quite a manoeuvre which involved a lorry with a lifting arm (camion con gru), a very strong trolley and friendly neighbours. The trolley was fairly useless over the bumpy courtyard stone. We had to get it craned over the wall, then it took three strong men to help move it into position. To get it up into the fireplace at an angle, the “gru” hook was dropped down the chimney and took the weight, as it was manoeuvred into place, and a stone shelf quickly built underneath. When we hear how much our friends are paying for their gas central heating, it seems worth chopping the wood and making a fire. The reason our stove is so heavy and large is because it has two metals water tanks built into the back and top. These were plumbed into our central heating system and hot water pipes, for hot taps and showers. The fire heats enough hot water in the tank to serve six large radiators. The only downside is that hot water doesn’t come instantly out of the taps and you have to light a fire to get hot water and heating. But, when we hear how much our friends are paying for their gas central heating, it seems worth chopping the wood and making a fire. Another possibility is to be able to switch between options, as we do with our hot water. On sunny days, we just turn a couple of levers and our hot water comes from the solar panel instead. If you want the economy of wood without the need to carry in logs and find a space to store them, pellet stoves are another economical option which is becoming popular in Italy for central heating. 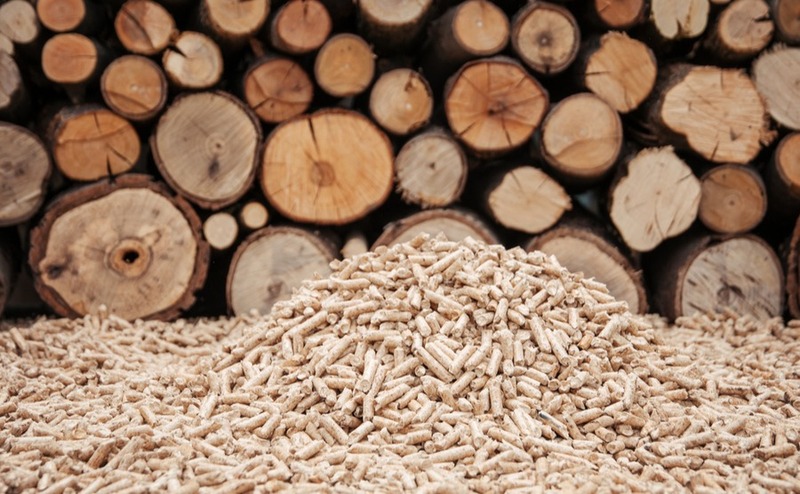 Wood pellets are made from recycled materials and are heavily compressed, which reduces the moisture content. This dry fuel creates more heat, causing the pellets to burn hotter and cleaner. The benefits are that they come in a sack and the stove doesn’t need filling as often as putting wood on a fire. The pellet stoves do require a little electricity to gradually feed the pellets into the stove and to run fans to emit the warm air, so you won’t have heat if you lose electric power. The fans can be a little noisy, so many people choose to put the pellet stove in a storage room rather than their main living area. A wood pellet stove can be less hassle, but does require a bit of electricity. If you are about to renovate a property that needs heating installed, you’ll need to decide at an early stage what type you want, as pipes may need to be put under flooring or in walls. With an old stone house this isn’t always an easy task, as it could involve lifting stone floors and cutting into the stone walls. Under floor heating can also work well, as any ancient Roman will tell you. Gas or oil are still commonly used for central heating, largely because it provides instant heat and is clean and easy to use. If you plan on having rental guests it is going to be the easiest and safest option. Countryside kitchens can also get very warm when using a traditional wood burning stove with hot plate and oven. So why not roast yourself some chestnuts and settle down by the fire with a deliciously thick Italian hot chocolate. 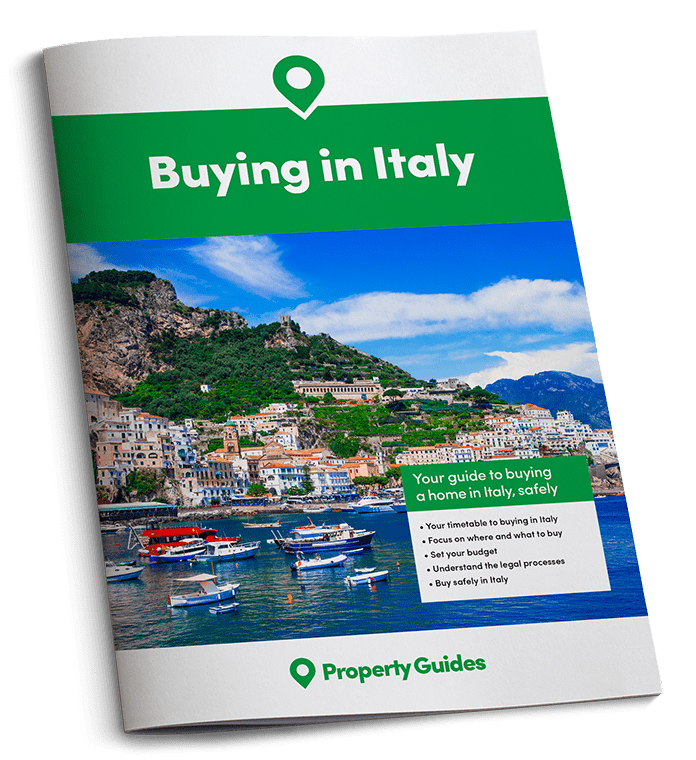 If you have any questions about moving to Italy, give our Resource Centre a ring on 020 7898 0549 or send us an email at italy@propertyguides.com.